How Much Ad Revenue is Digital Really Stealing from Traditional Media? New York, 29th Jul 2015 – With marketer demand for digital media exploding, a new Standard Media Index (SMI) analysis has been able to pinpoint with a high level of accuracy just how much the shift to new media has cost the traditional channels. To conduct this analysis, SMI looked closely at the flow of advertising dollars across the media landscape through the first nine months of the broadcast season (October ‘14 – June ‘15), compared to the same time period last year. Given SMI’s 80% footprint of total national U.S. agency spend, these new full-market figures are the most accurate estimates of the true impact that digital media is having on the evolving ad sector, thanks to SMI’s ability to capture actual booking data from major agencies. For this analysis, SMI used its actual ad spend data and extrapolated it to full-market in order to provide a new level of marketplace insight. The following chart shows the drivers of digital advertising growth over the first nine months of the 2014-15 broadcast year, and the key takeaway is that digital’s growth has come from a combination of dollars being pulled from all other media types, as well as significant organic (new) growth. 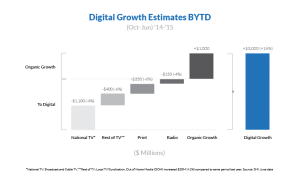 The overall market is up about $1 billion dollars YoY (+1%), with this money representing digital’s organic growth. The results show that digital is siphoning share away from other media, with the bulk of it coming from television. On the national TV front, the scatter market has clawed back about 35% of the ad revenue lost in the soft 14-15 upfront, however the remainder of those dollars have flowed into digital.